Baby Costs > How Much Do Baby Clothes Cost? Baby clothes come in a wide variety of styles and sizes. Most of the time, you will want to purchase a size larger than you baby’s current size so that you can get more use out of each outfit. Each brand tends to fit differently, so it is best to experiment with a few things before you purchase a large amount of clothing. Most brands of baby clothing come in sizes by month until the child is 24 months. After that, sizes begin to be labeled as 2T or 3T and can become more expensive. A complete outfit for a baby can usually be found for $7 to $20. This price will depend on the store and brand as well as whether the outfit is made for summer or winter. The more material used for the outfit, the more it will cost. Refer to our chart below that showcases the most popular brands found in stores, along with the pricing. For example, a summer outfit with shorts and a tee shirt will cost about $8 and a winter outfit of pants and a long-sleeved tee shirt or a sweatshirt will cost about $16 at a local Target. One article of clothing that every baby will use a lot is a onesie. Onesies are great to put under outfits to give the baby a little extra warmth and comfort. Onesies come in a variety of sizes and colors and can be found in short or long sleeve. Onesies are usually sold in packages which contain three to five onesies. These packages will cost between $5-$20 depending on the brand and the style. According to babyslumber.com, “One-piece outfits with a zipper up the front are ideal for sleepwear, especially if they are made of cotton. They are warm, comfortable, non-restricting and generally have no superfluous trims that can be hazardous.” While many brands make sleepers, the best deal for these sleepers is probably the Gerber brand. These sleepers can be purchased in two or three packs for between $7 and $15. Shirts and pants purchased separately will usually cost between $5-$15 per article of clothing. Make sure that you purchase clothes that are comfortable for your baby. Consider a pair that is easy to put on. Remember that you’re going to have to change diapers constantly throughout the day. If your baby is outgrowing clothes, such as a one-piece pajama suit, consider cutting the feet off to extend the longevity of the clothes. With pants, consider cutting them down to turn them into something such as shorts. Try to avoid the size 3 to 6 months stage as newborns can outgrow these stages rather fast. Although shoes aren’t really necessary before a baby can walk, sometimes people choose to have their babies wear shoes for looks. Most outfits purchased do not include these, and shoes will cost about $15-$50 depending on the brand and style. Socks are important for babies to keep warm A package of socks can usually be found for $5 or less. There are many people, especially those with only one child, who take good care of their clothing and then decide to sell it when their kids are too big to wear it. 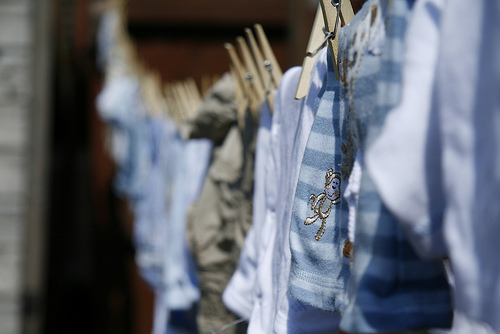 Used baby clothes can be found at local garage sales, mom-to-mom sales, and even at websites such as eBay. Most children’s stores, such as The Children’s Place, offer programs for loyal customers to receive discounts and coupons as a reward for shopping at their store. If purchasing online or even in store, consider buying heavily discounted gift cards at Raise.com.